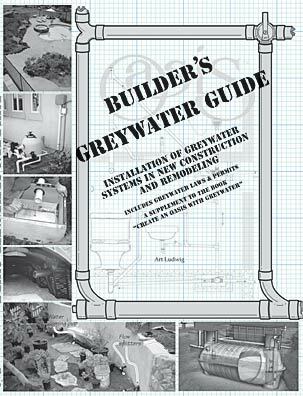 The Builder's Greywater Guide, a supplement to Oasis's book The New Create an Oasis with Grey Water (book), will help building professionals or homeowners work within or around building codes to successfully include greywater systems in new construction or remodeling in the US, even if they have little prior greywater experience. Topics include: Special reasons for builders to install or not install a greywater system, flow chart for choosing a system, suggestions for dealing with inspectors, legal requirements checklist, detailed review of system options with respect to the new laws, latest construction details and design tips, maintenance suggestions, equations for estimating irrigation demand, and the complete text of the new California greywater law with annotations from Oasis (the California greywater law is very similar to the greywater appendix in the Uniform Plumbing Code, which may apply in all of the US west of the Mississippi and several Eastern States). A do-it-yourself guide to designing, building, and maintaining your water tank, cistern or pond, and sustainably managing groundwater storage. It will help you with your independent water system, fire protection, and disaster preparedness, at low cost and using principles of ecological design. Includes building instructions for several styles of ferrocement water tanks.